The fact that January requires dessert is undisputed; anyone will tell you that a spoonful of sugar helps the medicine winter go down. But when it comes to what type of dessert to be had, there’s dissent: some call for chocolate, some demand the fire of booze, and still others want cozy, spicy treats that will warm from the inside out. Me? I want citrus. Citrus, because citrus fruits have the remarkable ability to transport you to the tropics, and citrus, because it’s reminiscent of the sunshine that’s to come. Citrus that, with it’s bright and tangy flavors, simulates everything that we’re missing (sunshine! summer! ), and citrus fruits that, thankfully, from lemons to satsumas to grapefruits are in season, and quite abundant. So, I made this pie. Always a fan of lemon meringue, this one particularly stood out to me, with a delightfully lemon-y filling that’s thicker (and less runny) than curd, and a flaky, all butter crust that stays crispy, thanks to a par-bake. As for the meringue on top? Well, who can argue with that? It’s a classic, to be sure, and a classic that shouldn’t be messed with, as you’ll see when you taste this pie. So go make some pie! Your January will thank you, your family will love you, and your friends will be ever so grateful for leftovers, should you have any. And you might not, although I wouldn’t blame you. Why I love this recipe: unlike other recipes which yield a filling that’s too runny, a crust which is soggy and a meringue that weeps, this one has a sturdy, buttery-rich filling that’s flavored with fresh lemon juice + zest, a meringue that’s made stable by cooking on the stove-top first, and a crust that stays crispy and flaky, due to a parbake. Heat oven to 375. On a lightly floured surface, roll out the dough to ¼ inch thick. Transfer it to a pie plate, and trim the edge so there is only 1/2 inch of overhang all around. Fold overhand underneath and crimp. For the filling: In a medium saucepan combine cornstarch, water, lemon juice, sugar, and salt. Whisk until no lumps remain in the cornstarch and bring the mixture to a boil, stirring frequently. Continue to cook, stirring constantly, for 75 seconds. The mixture will be clear and very thick. Whisk the egg yolks together in a medium bowl and slowly whisk the cornstarch mixture into the egg yolks while stirring constantly. Return the mixture to the saucepan and cook over low heat while stirring constantly for 60 more seconds. Do not let boil. For the meringue: Whisk the egg whites and sugar together in the bowl of a stand mixer. Place the bowl of the stand mixer over a double boiler and cook, stirring occasionally, until the egg whites are very warm to the touch and the sugar has dissolved. Whip the egg whites on medium-high until stiff peaks form. Add in the salt and vanilla extract and whip to combine well. Remove the parchment paper from the pie filling then carefully spread the meringue on top of the lemon filling in a decorative pattern. Make sure to spread the meringue all of the way to the crust. Torch the meringue with a boiler, or with a kitchen torch. Let pie sit in fridge for a few hours to set, and serve on day it’s baked. 22 Jan	This entry was published on January 22, 2015 at 5:59 pm. It’s filed under Delectables and tagged butter, citrus, dessert, food, january, lemon, lemon meringue pie, meringue, photography, pie, recipes, sugar, vscocam, winter. Bookmark the permalink. Follow any comments here with the RSS feed for this post. Couldn´t agree more on the sunshine that´s brought by citrus fruit , and is transported by your beautiful pie! Thanks Sabine! Any pie brings a smile to my face, but the sunshine color of this one makes it extra special! 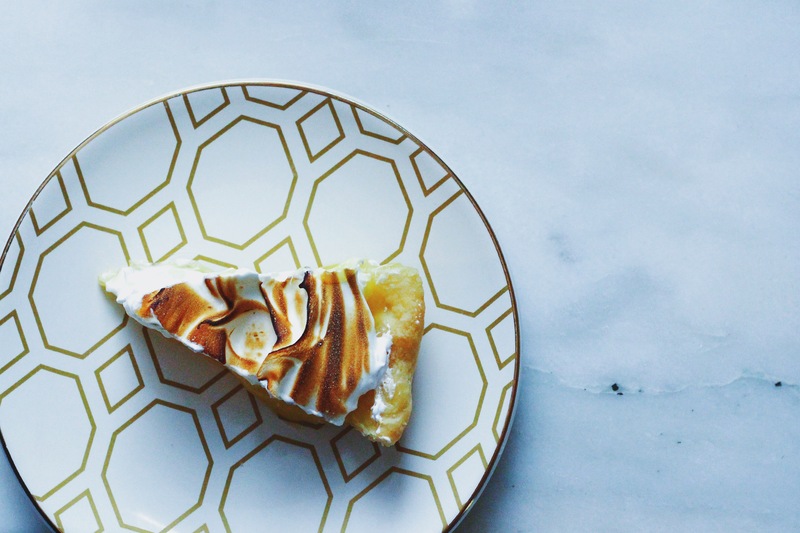 Few things are so fine as a lemon meringue pie. And a very fine one that is! Thanks so much Michelle! I completely agree- lemon meringue pie is one of my favorites! What a gorgeous pie! I too crave citrus in the winter. Man I want this. Do you have a kitchen torch or do you use high heat? OMG my favorite things. Sprinkles makes this smore cupcake that I”m OBSESSSSED with. Apparently it’s seasonal. Boo. Haha thanks! I’d send you some pie via airmail, except you totally have nicer citrus fruits in California ;). The swiss meringue is really great! Granted, it uses an extra bowl, but it makes the meringue so stable and easy to apply. Hope you’re having a great winter so far! Oh, and I made your peppermint tea tree bath! It was so amazing.